Last week, we collaborated with See Beautiful to make gratitude journals. See Beautiful is an organization that aims to empower young people to see beautiful in themselves, in others, and to create more beautiful in the world. Paint Love currently partners with two See Beautiful Clubs: 4/5 Academy and Globe Academy. This project was collaborated with Globe Academy and led by Lead Artist, Liz Carson from Kate's Club. Liz started the project by asking what gratitude means to each person. She demonstrated how to make an accordion-style journal and what kinds of things they can draw in it. Kids could draw people, places, and things that they're grateful for. The unique thing that Liz suggested is that instead of drawing the actual people their grateful for, they should draw something that represents them. Something that is personal and unique to them. It makes the journals even more personal. Some students drew animals to represent their parents, others drew sports or even superheros! It was so much fun talking with the kids and seeing how they depict the important people in their lives! 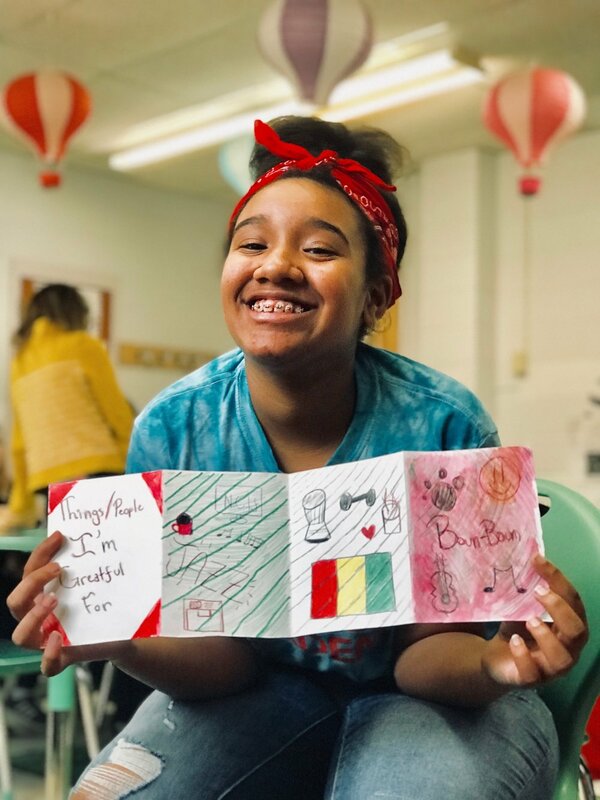 We loved helping these kids make these unique journals and look forward to working with See Beautiful again!